Oleg Galich was born in Moscow, Russia. He took up photography almost twenty years ago and has worked as a freelancer for many years shooting for model agencies, newspapers, and the like. He currently lives in New York City and loves the atmosphere there. It's a superb environment for taking great pictures, he says. It's inspiring just being there. He is now working as a photographer-assistant and part-time as a lab technician. When shooting nudes, he often likes to use a soft focus technique to enhance the dreamy quality of his model's skin and appearance. 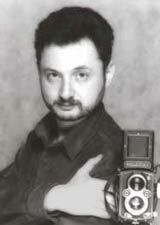 He shoots with Olympus and Mamiya cameras as well as with a variety of soft focus lens types. His printing skills are undoubtedly astute, since he does it professionally, and he is seeking assistance in the sales and marketing of his fine art prints.